TRX Training is a supplier of equipment that can be used to get fit at home or anywhere. No need for the time or expense associated with a conventional gym. A great idea. TRX training is a company that supplies fitness equipment. They have developed a fitness package that can be used anywhere. Now this is good news for me who does not have the time to go to a gym. This whole system seems to be based around something called suspension training. This is where your body is suspended in one form or another and so you are using your body weight as resistance. I know this is an effective way to exercise as I have been known to love Pilates and Pilates is all about using your own body weight to provide enough resistance to develop your fitness. So far, the TRX system seems to be one of the best out there. Suspension Training - This is a system of exercise training that uses your own body weight to help you lose weight. Not a novel approach by any means but it is one that is becoming a lot more popular. For me, a Mom, being able to exercise wherever I am (without having to go out of my way or reduce my sleeping hours in order to fit in the gym) is a great bonus. My only concern was that it all looked so complicated. The TRX Suspension Training Pro Pack comes with two straps that will help you suspend different parts of your body off the ground. Being off the ground will engage muscles in various parts of your body. For instance, take a look at the picture (Courtesy of Wikipedia), doing a move like that would definitely engage your core muscles and arm muscles and possibly back muscles and more. And yet, it is not so complicated that a beginner cannot do it. And that is the best thing, really - the ability for anyone to do these exercises anywhere. And the better than best thing (if such a thing were possible) is the fact that suspension training definitely makes use of the core muscles for practically all the exercises as you will need to hold yourself stable if suspended. Working my core is my priority at the moment as I try to regain some strength in my core after giving birth three times in quick succession. 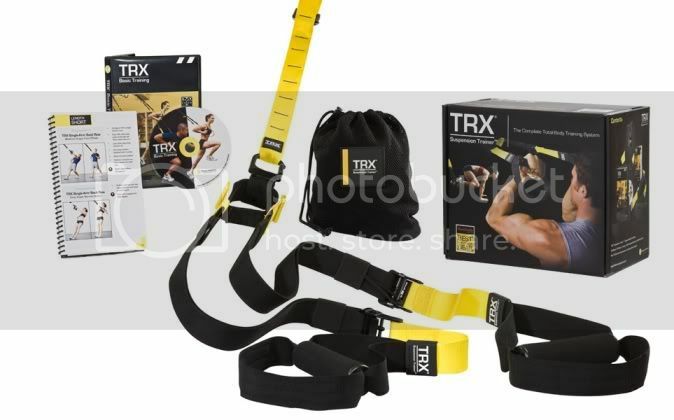 Apart from the straps, the TRX Suspension Training Pro Pack also comes with a door anchor and a basic training DVD which is over an hour long. For times when you are not in front of a screen , there is also a workout guide with illustrations of all the moves in it. The whole pack can be fit into a small mesh bag which is also part of the pro pack. The TRX website is full of information about the items and the whole range of fitness equipment that they cover. Click on the image to get taken there. One thing you can add to the TRX Suspension Pro Pack is the extender. If you choose to use the pack outside, possibly against a tree, you can use one or more extenders to help. Each one is 37 inches long and they are made very durable and light. Its really need to have the correct guidance for the home gym, thanks for sharing the information its being very helpful. You can do great workouts at home if you can not get to a gym, so get your work out in at home to remain in good shape. Get a gym membership, or work out at home? If you're trying to decide what's best for you, here are 10 reasons why home workouts can be preferable to the gym.